Kelp is a seaweed harvested from rocky ocean shores around the world. It's a member of the brown algae family, of which there are more than 30 different varieties. Bongo kelp is the most common form used in nutritional supplements. This form of kelp is rich in iodine, potassium, magnesium, calcium and iron, among many other minerals. In fact, 70 minerals and trace elements are present in kelp. Kelp has many nutrients and elements and is a good nutritional supplement because it contains many components to make the body healthy. These components work with your body by providing many of the nutrients you may otherwise lack. One of the most recognized kelp benefits is thyroid regulation. Kelp is rich in iodine, which is important for thyroid function. Your thyroid absorbs iodine from your blood in order to make and distribute hormones into your body. Without iodine, your thyroid isn't able to function properly; when your body is deficient in iodine, your thyroid doesn't work correctly and your metabolism slows. You'll end up gaining weight and potentially putting your health at risk. Iodine deficiency is common among people who don't eat sea vegetables, dairy and seafood. Taking kelp supplements can help overcome iodine deficiency. Another important component of kelp is alkali. Alkali helps your body maintain the balance between acid and alkaline. Your body's pH balance is dependent on the food you put into your body. When you become sick or when you eat low quality foods, your body becomes more and more acidic. Taking alkali into your body with kelp can help you stay balanced and healthy. Lowering of cholesterol levels - Atlantic sea kelp has been shown to lower the blood serum cholesterol levels, which can have an effect on overall cholesterol. Boosted immunity - Kelp has been shown to be effective against infections such as influenza, herpes and HIV. Cancer prevention - Some preliminary tests have shown a link between kelp and cancer prevention. Radiation prevention - A link has been found between kelp and boosting the body's blood system protein complex, which can protect against fatal levels of radiation. 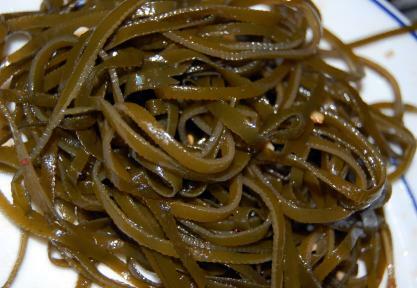 Antioxidants - All seaweeds, including kelp, have been found to have extremely high levels of antioxidants. If you suspect you may be deficient in iodine, or if you think kelp could help with a different problem, first consult your doctor before adding any supplement. Kelp is potentially dangerous in large amounts because of the iodine. Read the label and follow directions carefully; there is no regulation on kelp supplements, which means the amount may vary from supplement to supplement. Take only the amount recommended by your doctor. Keep in mind that kelp supplements may lose potency after a while so you shouldn't keep them in your cabinet for years on end. In addition to the many benefits that kelp brings, there is the potential for some side effects as well. Remember to speak to your doctor before taking kelp, and do mention to your doctor if you are already taking kelp. If you experience any adverse symptoms while taking kelp, immediately speak to your physician. Kelp has a large amound of iodine and other chemicals, which if taken in excess can be toxic. Be sure to not overdose on kelp products. When used properly and under a doctor's supervision, kelp can be a great addition to a healthy diet. Try supplementing with kelp and see if it makes a difference in your health.